This has been the coldest Spring I can remember in years and years, we even had snow on the day I wrote this post for My Mind's Eye, but that hasn't stopped me from dreaming about warmer weather and being outdoors with my girls. Hello friends, it's time again for Mini Albums with Monika and today we're going to make our very own mini album together. And what's great about this album, is that you can easily recreate the same look with either the My Girl or My Boy collections that we're all in love with. Each of the collections have the same designs, just in different color ways and are interchangeable with one another if you happen to have one spunky little girl that loves blue more than pink, like we do. 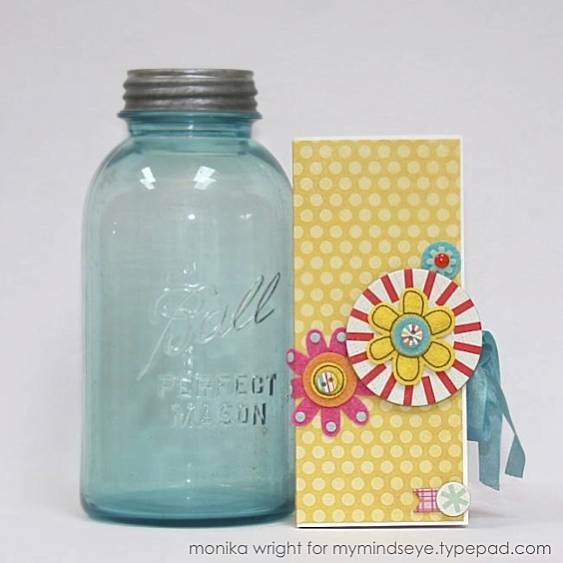 There's a download with a supply list and cutting tutorial at the end of the post I created for My Mind's Eye and you can find that here. So for now, I'll just share photos with you here. If you have any questions about anything at all, leave them in the comments and I'll answer them for you there. You've created your pages and tags, so here's where the real fun begins. 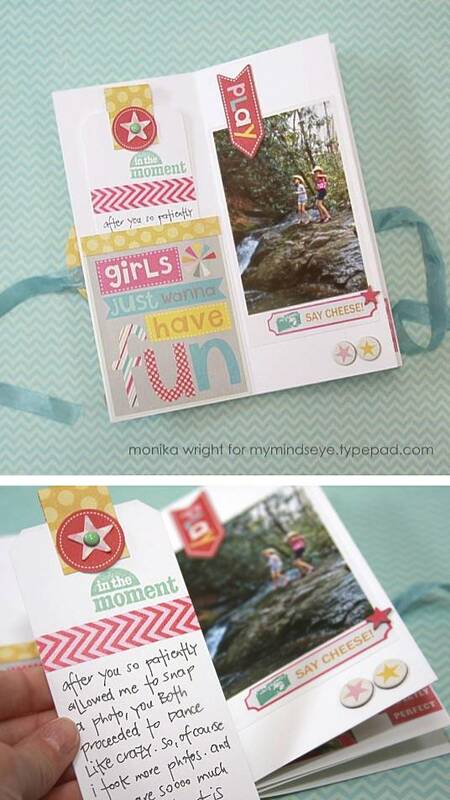 I'm using the right page for photos and the left side holds the pocket we made with our journaling cards. I trimmed the photo somewhat like an elongated Polaroid and added a label sticker and chipboard element to that wide white strip at the bottom of my fake Polaroid. 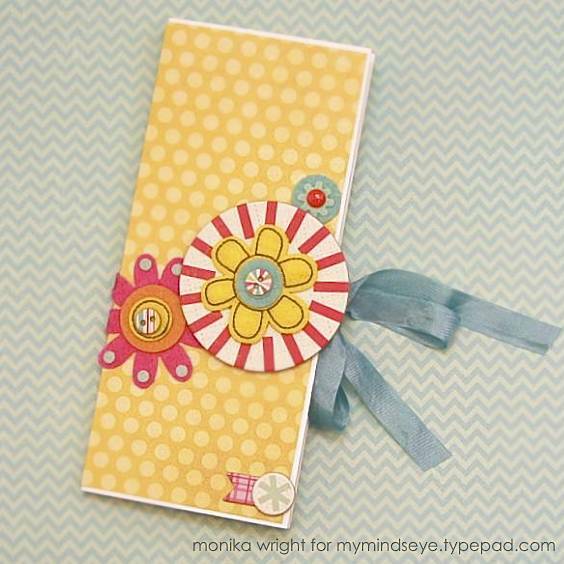 For the tag, after adhering the pattern paper tab, I popped a decorative brad on top, stamped my sentiment and then my journaling beneath a strip of decorative tape. Here, you can see how I added the border strip I talk about in the tutorial to the pocket. That's right, I used a whole slew of tiny word stickers to jump start my journaling! Then, just so she knows how perfect we know she is, I added more tiny word stickers to the right page. 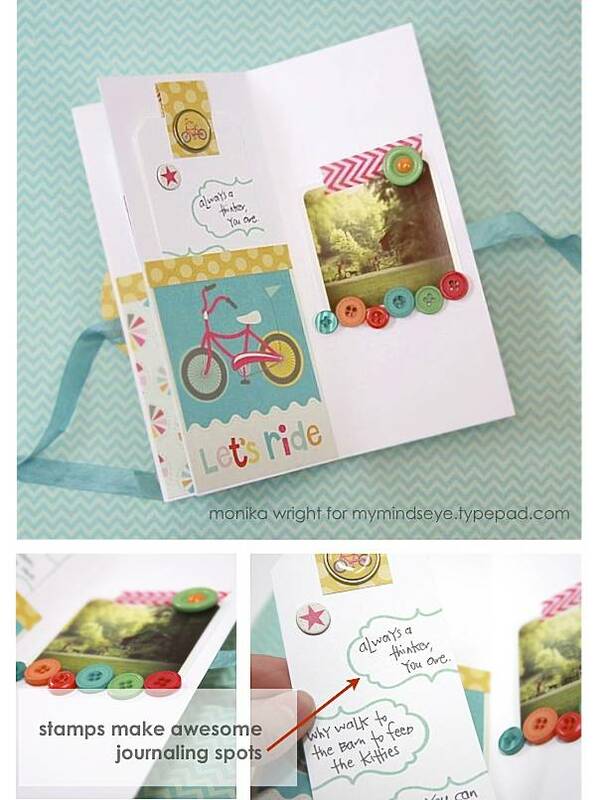 Notice that on this page, I'm showing that you don't have to use journaling cards for the pocket. 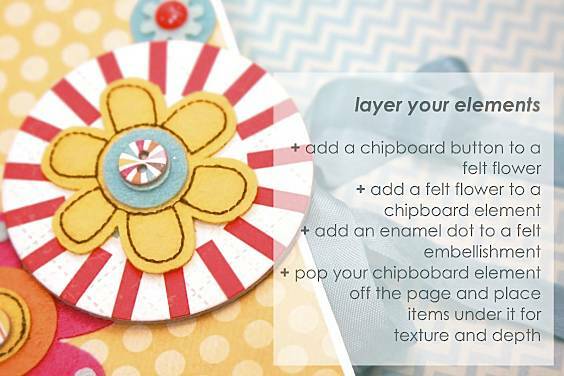 Use the same concept, outlined in the tutorial download, with pattern paper. DESIGN TIP | I printed this "photo strip" on one 4x6 photo and then trimmed the two rows and added them as one strip. I was kinda too lazy to pull out the 8x10 paper, so I cheated. I am wild about bracket-shaped anything and there just happens to be a perfectly delightful stamp in the Collectable Unforgettable "Today" set...perfect for so much, but especially for journaling! Because I used a muted filter on my photo, I felt the right side needed fun pops of color, which was accomplished with more decorative tape, buttons and an enamel dot. I always decorate the cover last, just in case I change my focus along the way while I'm creating the inside pages. I create without a plan, a sketch or any preconceived ideas, I just pull stuff out and let 'er rip. 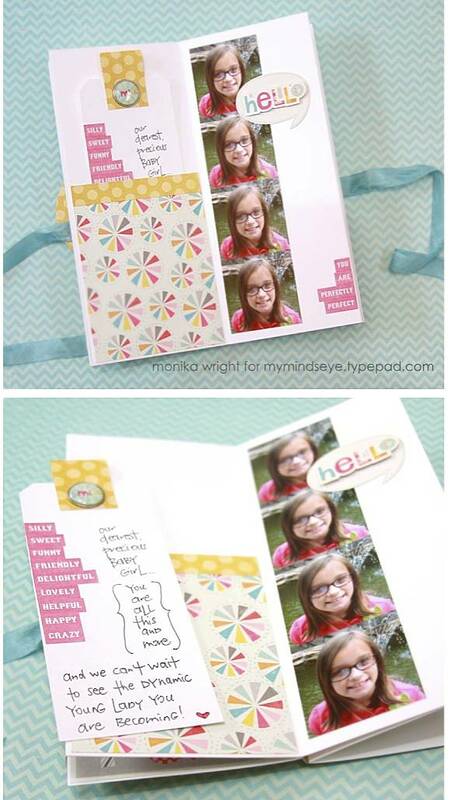 Download your supply list and photo tutorial at the bottom of this post on the MME blog, where I first featured this mini album. I'm happy to answer any questions you may have, just leave a comment here and I'll reply. Note to Spring...where are you? I can't wait to make one for my vacation you're such a inspiration for me. Can you eventually make a tutorial for binding of those Minis?